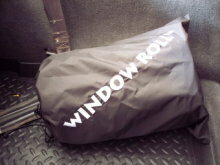 Keep your Window Roll clean and easy to store when not in use with our new Window Roll Storage Bag. 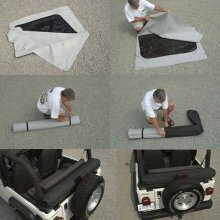 Like the Window Roll, the storage bag is proudly made in the USA. The bag is made of durable black nylon and features a drawstring closure top and the Window Roll logo embroidred in white. Simply rollup the Window Roll and cover and slip it in the Storage Bag when you're not using it. Bag measures approximately 15" x 21". Made in the U.S.A.